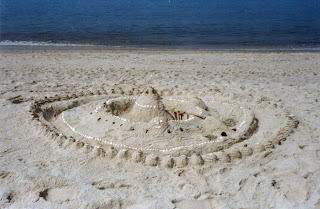 >Build a sandcastle. To build a sandcastle, you will need damp sand that can be packed into a container or can be shaped by hand into different castle parts. Hint: Shells, grass, sticks and leaves can be used to decorate your sandcastle. Make this a family activity: Have the whole family work together to build the castle. This activity promotes planning and designing.